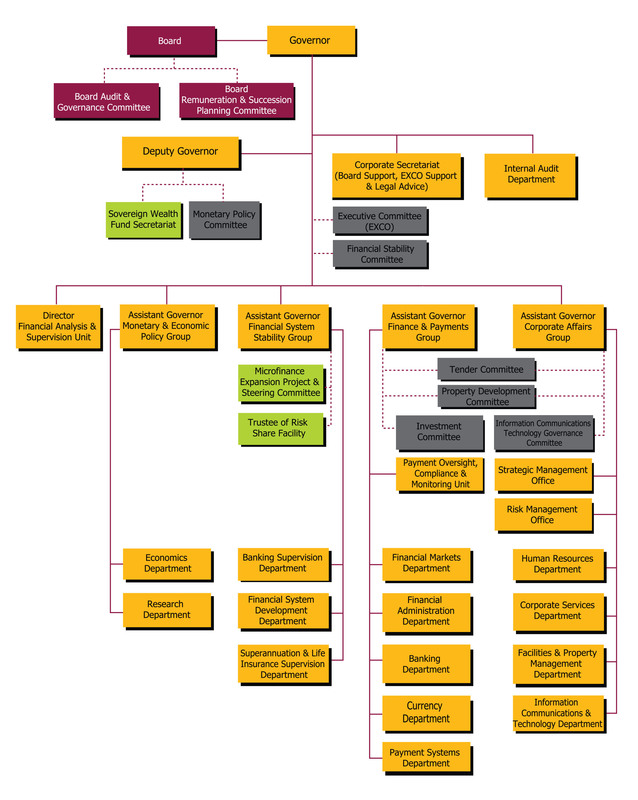 The Bank of PNG has a Governance system comprising of external and internal Committees. The Roles of the Committees are critical to the Banks Management activities to ensure transparency and good governance practices are evident. The Bank’s governance practice starts with the Board and its responsibility to ensure the Bank’s policies (other than monetary policy and financial system regulations, which are the exclusive responsibility of the Governor) are directed to the greatest advantage of the people of Papua New Guinea. The Governor is the Chairman of the Board. The Board Audit and Governance Committee is charged with assisting the Bard to ensure the Banks performance in financial reporting, internal controls and Governance meet the required standards and expectations. The Executive Committee (EXCO) is the principal committee advising the Governor on all matters relating to his functions and responsibilities as stated in the Central Banking Act 2000. The purpose of the Committee is to assist the Board to ensure that principles of good corporate governance especially in relation to terms and conditions of employment of the Governor are adhered to at all times within the Bank. The purpose of this committee is to advice the Governor on the Design, Formulation and Implementation of the Monetary Policy. This committee core function is to advice the Governor on all matters relating to the investment and management of the Nation’s Foreign Exchange Reserves. Economic – this department is responsible for data compilation and analysis of the monetary sector, external sector (balance of payments) and the economy as a whole and in formulating the monetary policy, also providing policy advice to the Governor and representation in Government macroeconomic policy discussion and in discussion and dialogue with international organisations such as the International Monetary Fund. Research – the Department comprises of two units: Economic Analysis Unit (EAU) and Projects Unit (PU). The Department’s primary responsibilities are to carry out research that enhance economic knowledge to aid sound decision making, provide input into and participate in the formulation of monetary policy and increase public understanding of financial economic issues. The group’s roles and functions involve dealing with financial matters for and on behalf of the Bank. These activities include custodianship of Papua New Guinea’s currency, Kina and Toea, managing the country’s foreign exchange reserves, banker to the Government, oversight of the Bank’s annual budget and the national payment system. The group’s working relationship covers internal and external stakeholders in Papua New Guinea and overseas. These relationships are crucial in implementing monetary policy, efficient functioning of the Bank and supporting the economic and financial functioning of the domestic economy. There are five departments in this group. Banking – this department provides reliable and efficient retail banking services for the Government. Currency – the Currency department is one of the core function departments of the Bank of Papua New Guinea. This department main objective is to issue national currency and maintain its acceptability. Under this department are two units that assist in carrying out its functions: Control Unit and Processing Unit. Financial Administration – this department is responsible for providing financial support to all functions of the Bank. Under this department are three units that help in achieving this responsibility: Accounting & Payments Unit, Management Reporting Unit and Settlements Unit. Financial Markets – This department is responsible for implementing the Bank’s monetary policy decisions, develop and facilitate effective functioning of domestic money markets, administer and participate in domestic foreign exchange systems, manage Bank’s foreign exchange reserves. This department is made up of four units: Foreign Reserve Unit, Middle Office Unit, Money Markets Operation Unit and Registry Unit. Payment Systems – The Payment Systems Department (PSD) is responsible for ensuring the National Payments System is efficient, robust and operating smoothly, with the goal to ascertain that payments are successfully transferred from payer to payee, in a timely manner. The PSD also leads the implementation of new systems and upgrades to promote innovation and competition. 2. Switch Operation & Support Unit (SOSU). Both Units represent two (2) of the systemically important payments systems currently facilitated and operated by the Bank of Papua New Guinea. KATS is the Real-Time Gross Settlement (RTGS) system and Automated Clearing House (ACH) for cheques and direct credits operated by KOSU while the National Switch for card and mobile payments is operated by SOSU. The Corporate Affairs Group plays a supportive and facilitative role to the Bank by providing adequate and quality corporate services, designing, developing and implementing appropriate information technology systems and procedures and maintaining and fostering a good working relationship with various government agencies and other stake holders. There are four departments in this group. Corporate Services – this department provides strategic support and operational services to support the core business of the Bank. There are three units under this department that support the Corporate Affairs of the Bank: General Services Unit, Security Unit and Communications & Publication Unit. Human Resource – the main role of this department is to identify, develop and deploy a comprehensive and integrated approach to human resource strategy and polices in the area of recruitment, talent management, talent development, succession planning and the Bank’s performance management efforts. Strategy & Planning Unit, Admin Support Unit and Client Support Unit are three units under this department that contribute to the roles and responsibilities of the department. Information Technology – the objective of the IT department is to deliver and maintain a strategic and highly effective IT service. It’s primary role includes maintaining and continuously improving the Banks IT network and data centre infrastructure, supporting and providing leadership and advice on the development and implementation of the Bank’s integrated business applications. Facilities & Property Management – this department organises, controls and coordinates the strategic and operational management of buildings and facilities in order to ensure the proper and efficient operation of all physical aspects, creating and sustaining safe and productive environments for Staff and visitors. Banking Supervision – this department’s objective is to maintain a sound market-based financial system through risk-based prudential supervision of authorized deposit-taking institutions. This role is carried out by two units: Banking and Finance Unit and Savings & Loans Societies Unit. Microfinance Unit and Policy & Licensing Unit are also under this department. Superannuation & Life Insurance – the principal function of this department is to promote the general stability, regulation and supervision of the superannuation and Life Insurance industry. There are three units under this department: Superannuation Unit, Policy & Licensing Unit and Life Insurance Unit. Financial System Development – the primary responsibility of this department is to develop, maintain and refine regulation, policies and procedures to enable the Bank to effectively undertake supervision and ensure sound management of the banking, financial services, savings and loans, superannuation and life insurance sectors of the financial services industry.